Siddhant Karnick got married to Megha Gupta in a quiet registered marriage. The bride’s father had expired a month back so there were no gala celebrations. The actor exclusively told Bollywood Life that they are going to Canada for a trip. News floated in that Naagin actress Aashka Goradia has found love once again and her rumoured beau is a foreigner. The romantic Insta post also suggested the same. Rohitash Gaud who plays Manmohan Tiwari on Bhabhi Ji Ghar Par Hai was denied an US visa. He was extremely disappointed as he could not be part of a special celebration in the US. TV actress Roshni Chopra who is seen on shows like Kasamh Se and Comedy Nights with Kapil welcomed her second son, Ryan with husband Siddharth Anand Kumar. She already has a son, Jaiveer. News floated around that Jacqueline Fernandez was being paid around Rs one crore per episode for Jhalak Dikhhla Jaa 9. It is a huge amount for the actress, if true. It was announced that Zee TV’s Meri Saasu Maa would go off air from August 26. It will be replaced by a new story inspired by Baghban, Sanyukt. 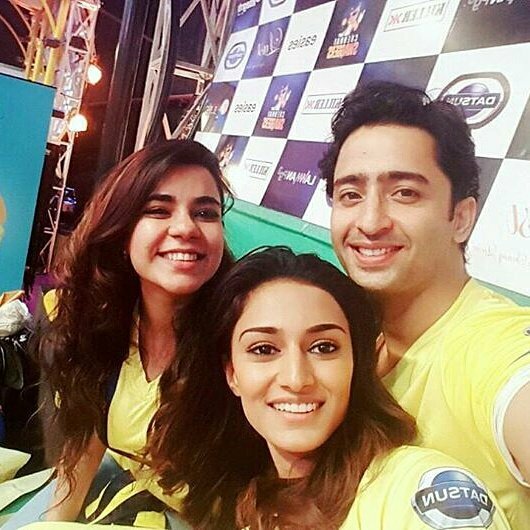 Fans were curious when a leading daily reported that Shaheer Sheikh and Erica Fernandes were a couple. However, the actor clarified that were just good friends. One of the most liked love stories on Star Plus Jaana Na Dil Se Door completed 100 episodes much to the delight of fans. Rumours did the rounds that Mohit Malik who was last seen on Jhalak Dikhhlaa Jaa is slated to enter the sci-fi comedy Bahu Humari Rajnikant. We saw how Sonakshi (Erica Fernandes) was devastated after Dev broke up with her on the show. Now, actor Jay Soni has entered the show as her Bengali matrimonial alliance, Ritwik. In Swaragini, Ragini (Tejaswi Prakash) confessed to Swara (Helly Shah) about the blackmailer. They have now joined hands to expose him on the show. A huge showdown happened Ruhi (Aditi Bhatia), I****a (Divyanka Tripathi) and Shagun (Anita Hassanandani) on Yeh Hai Mohabbatein. Shakti saw a huge ***** between Soumya (Rubina Dilaik) and Harman (Vivian Dsena). Roop Durgapal is all set to enter Gangaa on &TV after her stint on Kuch Rang Pyar Ke Aise Bhi. Priya Shinde of Naagin fame is entering Yeh Kahaan Aa Gaye Hum.